Twitter's Trier-Lynn Bryant speaks to first-generation students about what makes them unique in today's workplace. Starting and navigating the career-planning process can be daunting for any college student, but especially for those who will be the first in their families to graduate from college. 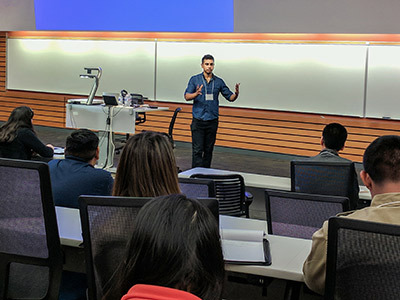 UC Merced’s Office of Leadership, Service and Career and Office of Undergraduate Education hosted the campus’s inaugural First Generation Career Conference earlier this month. The full-day event included a keynote speaker, workshops led by recruiting professionals, and a networking reception in an effort to build career development knowledge and address the unique career challenges first-generation students face when transitioning through college. 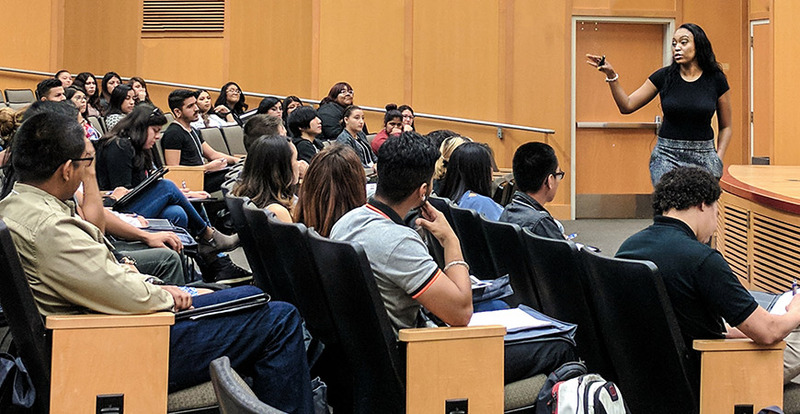 Because 72 percent of UC Merced’s undergraduate students are first-generation, developing programs that connect students to existing career resources is crucial to improving their success. Alumnus William Torrez shares the specific skills recruiters are looking for in today's applicants. More than 100 first-generation students started the day hearing from Twitter’s head of Revenue, General & Administrative and University Recruiting Trier-Lynn Bryant. Bryant is prominently involved as a trainer and facilitator at America Needs You, a nonprofit that advocates for first-generation students. She first visited UC Merced last fall for a Twitter recruitment event at which she hosted club and organization leaders for a diversity and inclusion networking dinner. The diversity theme was prominent during her conference keynote as well. Bryant described experiences from her time in the military, as a finance officer on Wall Street and in her current role in the tech world. She encouraged the students to use their diversity to their advantage. Different equals diversity, and that’s leverage. Professional services recruiters with Aerotek, one of the largest staffing and recruiting company in the U.S., led workshops on interviewing and resume building. Jess Smith shared tips for students to transform their resume into a powerful tool that will get interviews. Ludieliz Silaya shared the best strategies to have a flawless interview. A highlight for many students was a workshop led by UC Merced alumnus William Torrez on how to leverage LinkedIn to network with recruiters. Torrez, who is from California’s Inland Empire and graduated in 2014 with a degree in cognitive science, has worked for several companies in different industries and has gained significant job search experience. Now, he leads university recruitment for Procore Technologies, a global construction software company. During his first couple of years at UC Merced, Torrez worked the 6 a.m. shift at the Lantern Café. He didn’t start thinking about his career aspirations until he worked as a student assistant in the Students First Center and served as director of Communications and Public Affairs for the Associated Students at UC Merced. He recalled the time he asked Vice Chancellor for Student Affairs Charles Nies for advice about whether to study abroad or intern at PG&E the following semester. During his workshop, Torrez provided tips on how to connect with recruiters and emphasized the need for networking. Leslie Renteria Salome, a third-year sociology major from the San Diego area, hoped to meet other students with similar experiences, but she gained much more from the conference. After the conference, Renteria Salome immediately set up an appointment and met with a career specialist to discuss applying for graduate school to study urban planning. The First Generation Career Conference was made possible by funds from the University of California Office of the President that were allocated to the campus for recruitment and retention efforts. UC Merced hopes to find funding to make it an annual event to continue to support first-generation students as they navigate the college experience and transition to post-graduation career or continuing education goals.